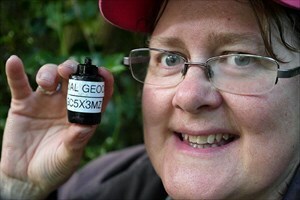 #5252 found @ 20:34:00, cache 6 of 9 today, geostreak Day #318. This evening I was out for an explore after work around King's Langley and Abbots Langley, picking up a few choice unusual caches and a high DT traditional. This was another of my specific target caches for today. I had come prepared and was very glad of my Wellies. Although the mini swamp wasn't too bad today, it would have made a mess of shoes or trainers so I was thankful for the warning. On arrival around GZ I couldn't spot anything initially, but widening my search a bit (the GPS was all over the place) I suddenly noticed something out of the corner of my eye. Aha! I had also come prepared with the necessary liquid, but realied that I probably needed to be quite quick with the retrieval or I may run out! Thankfully I timed it right and the cache popped up nicely. Thanks for a fun little cache and interesting DT combo here. Have a fave.